And God Laughs: GI Doh! I feel like I need to apologize for all of the years that I took eating for granted and never appreciated it the way that it should be appreciated. These past two and a half years have taught me many things, including that there is so much more to the process of eating than I had ever appreciated. I have a far greater respect for how much work many of my kids do just to eat. I had last been to see the GI doctor last May when I was having another fun round with severe dysphagia and serving as a taste tester for infant foods. The muscles finally got their groove back and I figured I was good to go. There was one hitch in the "all is better" though. It turned out that the only foods my stomach would accept without extreme reactions (pain, violent nausea, vomiting) were simple carbohydrates. My meal choices were narrowed down to breakfast cereal, oatmeal, bread, bagels (I occasionally still choke on those), rice, tortilla chips, pancakes, mashed potatoes, and macaroni. Oh, and I can tolerate milk and small amounts of cheese and freeze dried peaches and apples (to make eating them easier). This diet not only got old after a while - cereal for three meals a day is not something I recommend. The other concern is that I am missing huge aspects of a healthy diet like protein, and potassium, and a multitude of other essentials. What is also annoying is that I am eating very little, and have double checked by measuring calories, yet I am consistently gaining weight. Do you know how annoying that is? My third concern is that I get severe pain behind my right ribs at times, after I eat. So it was back to the GI doctor. The GI doctor and I apparently were not at the same train station at that appointment because he was focused on the occasional difficulty swallowing that has remained after the dysphagia which is not an issue. I was focused on the above issues. The two trains kept passing but never meeting. He even admitted twice to not listening to me as he was writing (doodling?) on a notepad. In the end he insisted I have another swallow study done before we look at anything else and I agreed to prove to him that I was right when I said I can swallow. So I had the swallow study done yesterday to please the GI doctor. I hate this test because Barium has its own specific definition of disgusting. 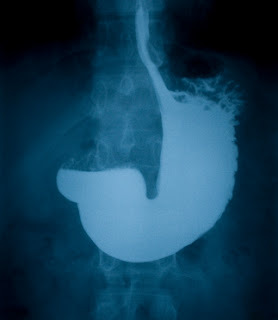 After a feast of Barium, the surprising results were that I can swallow fine. As I was waiting for the bus I noticed my mouth felt weird, but I attributed that to the fact that I had drank thick barium and eaten barium coated crackers and not been given anything to drink afterwards. I got home and was not feeling good so I took some benedryl for my allergies and laid down. I am so thankful I took benedryl. When I woke up my mouth still felt funny and my throat hurt but I still didn't connect the dots. I had to chug milk anytime I swallowed anything like my meds and I could not eat dinner and laid back down. It was not until evening when I looked in the mirror at my tongue that I discovered that it was swollen and covered in "hives"/raised sores. I had my mom look in my mouth and throat and it was all fire red, swollen and covered in the same "hives". I am betting these go all the way down into my stomach given the pain when swallowing and the stomach pain. Apparently in between the last swallow study and now I have developed an allergy to Barium. Now I know that the ER was probably a decent idea, but I could breathe fine and my ER copay is a great deterrent. I called the doctor today to see if maybe he could call in a round of steroids but he said to go to the ER. That copay is still a great deterrent and since it was not getting worse I decided to keep taking benedryl every 4 hours and stick it out at home as long as it does not get worse. The upside to this, once my tongue fits neatly back into its allocated spot in my mouth and I can swallow and talk normally again (I currently sound like I have been hitting the bottle hard as everything slurs together), is that I never have to do anything involving Barium again. So next Tuesday I go back to the GI doctor to go over my results (I already know - normal, duh!) and see what we do from there. I have an idea - lets look at something other than swallowing! I can get the food into my stomach, it is convincing the stomach that it is food that is the problem! Would you request a referral to a nutritionist? Already btdt? I need to revamp my vitamin/supplement regimen but have not been vigilant on this. You give me a meaningful reminder. Oh my gosh. What a mess. And you are right, barium is horrible. Ugh. I hate doctors sometimes...when they don't listen it makes me want to stab them in the eye with whatever is available. Sigh..